Today is "Laetare" Sunday or "rejoice" Sunday/Sunday of Joy. Celebrants at Mass have the option to use rose colored vestments today just as in Gaudete Sunday during Advent. This Sunday is a day to rejoice and remind ourselves that our austere penance during Lent is almost coming to a close and the events that define Christianity are about to come, especially Resurrection Sunday. This Sunday tells us, "we're almost there, so don't quit now." Today's readings introduce interesting themes; in particular, faith, the true Shepherd and Redeemer, and "God is in control." The first reading tells us about the Lord telling Samuel to get ready with his horn of oil because He has already chosen the king for His people. Samuel was the last Hebrew Judge and the first of the major prophets in Israel. 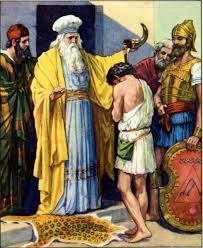 God tells Samuel to find the new king from among the sons of Jesse who he is supposed to anoint with the oil in the horn. Samuel looks at the sons and goes one by one assuming he chose the right one, but God tells him no. Human beings are prejudicial beings. We love to judge people based on appearance, or "lookism." Samuel was no different. He believed a leader/king should be of lofty stature and assumed a particular son with that characteristic is who God had chosen. However, God says, "Do not judge from his appearance or from his lofty stature, because I have rejected him. not as man see does God see, because man sees the appearance,but the Lord looks into the heart." These are powerful words we should meditate on by themselves. God looks at the heart, not at how we look. We should do the same. Instead of judging people by profiling them, we should look at their heart - their personality. sheep. The kid's name is David. David is described as being handsome and ruddy, obviously young but God chose him. Jesse and David of course are the descendants of Jesus the Messiah. The choosing of this young kid who is a shepherd is a prefigurement of Christ Himself. Jesus is to be the Good Shepherd and is also the Son of God. Even in an early age Jesus was doing God's work ( Luke 2:41-52) making a link to David who was the youngest and was chosen. This should remind the youth in the Church that they are indeed important and should take an active role in their respective parishes. 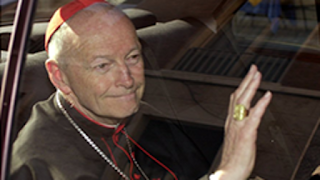 The Catholic Church is not for the "old" only. In response to the first reading, we read from the most famous and well known Psalm of all found in chapter 23 which begins with "The Lord is my shepherd." This Psalm connects both David and Christ. It speaks of how God is the shepherd and takes care of His own. He annoints with oil and fills the soul with grace (my "cup overflows"). God is indeed our shepherd and we should always have trust in Him. Last Sunday's first reading was about the Hebrews doubting God in the desert believing Moses to be some con artist who dragged them out to die. We should not be like them. Trusting God will bring "goodness and kindness" for the rest of our lives. As shepherd, God guides us on our path which is dark. The second reading from Ephesians tells us about this. We were in darkness and now are in the light of the Lord, the reading begins. St. Paul tells us that we should continue living as children of the light. He reminds us to do what is pleasing to God and avoid the things that are in darkness. Christ is the light (John 8:12). Without light, we cannot see physically speaking. The same applies spiritually. Today we live in a world that is adopting atheistic existential nihilism which originated from Nietzsche et.al and claims that life is meaningless, has no purpose and that we create our own "destinies." This philosophy, while claiming to liberate man has done nothing more than bring him down and imprison him in despair and psychological and spiritual oblivion. We are rational beings with free will and intellect; however, this does not mean we can guide ourselves. 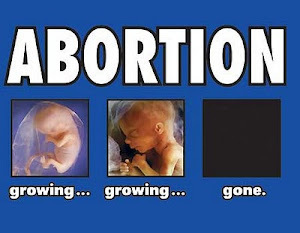 When we leave human beings to be an end in themselves, they guide each other in darkness and without proper vision in this environment, they all fall into the hole (Matthew 15:14). Only Christ can show us the way even in darkness. Only He can guide the way so that we won't fall into the hole. The themes of light and darkness are touched upon in the Gospel. We read in the Gospel how Jesus performs one of His "strangest" miracles recorded. Jesus passes by and sees a man who has been blind since birth. The disciples ask Him if this man is blind because of his sins or his parent's sins. Jesus replies, "neither he nor his parents sinned" and goes on to tell them that his disability exists in order for God to show His works. The disciples are holding to the idea that people who are disabled are in that state due to their sins. This brings to mind the "Moral Model" in disability studies which claims it is the fault of the disabled person that he/she is in that state and that this has to do with divine punishment. Jesus obviously disagrees. Jesus then does something that is both strange and disgusting, in human terms. He spits on the ground and makes clay with it. Then he smears the clay made with spit on the man's eyes. 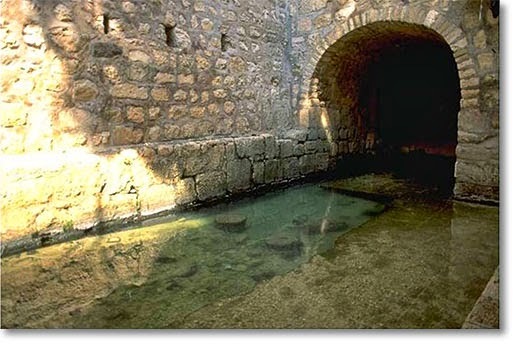 He then instructs the man to wash in the Pool of Siloam. When the man did as he was told, he came back with full vision. Those in the neighborhood could not believe it and were saying to themselves "isn't this the one who used to sit and beg?" They were in shock that this man is now able to see after they have gotten used to seeing him in a blind state begging for money. Immediately they questioned him and brought the man to the Pharisees. The Pharisees upon learning that Christ healed this man on the Sabbath declared that Christ is not of God. They made the Law in the Old Covenant into a god, so to speak. The Sabbath was made for man, not the other way around (Mark 2:27). The rest of the story tells us how the Jews did not believe and even questioned the beggar's parents who testified that he indeed was born blind. Then there is a debate on who Christ really is and His intentions. This Gospel has so many things I can write on, but will briefly get into them. First, the Gospel reminds us that we are born blind or spiritually blind. 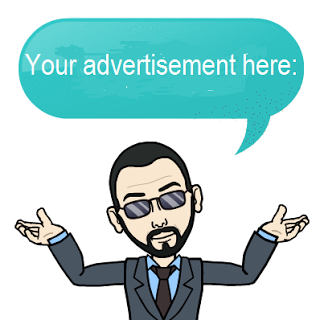 Atheists often make the claim that we are "atheists by default," I refute this here: http://sacerdotvs.blogspot.com/2013/04/atheism-as-default-fails.html. We are not "atheist" at conception but are merely spiritually blind. After Baptism, we start to regain our sight as we grow in faith and grace. This is why the man only gets sight after he washes himself in the Pool of Siloam. Once we have life in Christ can we truly begin to see like the beggar did. Second, Jesus in this story shows us how God does not discriminate. He sees the beggar who is blind, probably dirty and smelly, yet still approaches him. God does not judge by appearance as 1 Sam 16:76 states. Third, here is an interesting connection as well in regards to the clay. We read in Genesis 2:7 how God creates man from the clay of the Earth. Jesus uses clay to heal the man. Think about this for a moment. If pottery is broken, how is it repaired? We use clay to repair it. God made man out of the clay of the Earth and sin broke him. Christ comes and uses clay with spit to "fix" broken man. Christ makes all things new (2 Corinthians 5:17). We must approach Christ with faith and trust in Him. He will restore our sight and guide us as our shepherd through the "valley of the shadow of death" which surrounds this world. God is always in control. Despite Original Sin ruining nature, God still fixes it and guides it to perfection in Him. 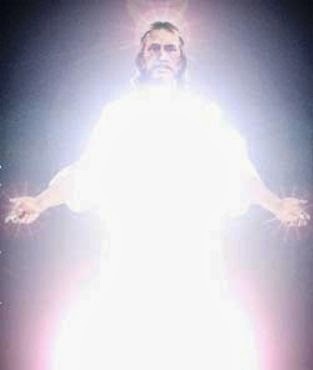 He is the Redeemer, the Savior who restores the Image of God in us with His light. 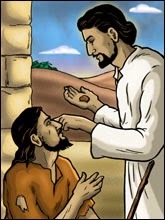 Today we rejoice with the "blind beggar" and shout out for all to hear: "I do believe, Lord."